Furthermore there is a Save The Children book donation drive, where across the 2 week celebration period IKEA visitors donating 5 or more books in store will get a £5 IKEA gift card in return. There is even Billy birthday cake available in the IKEA restaurant! 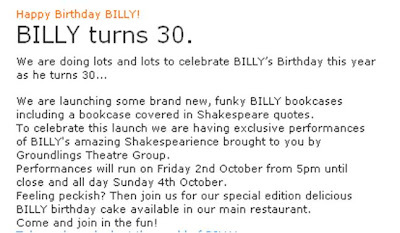 Looking for more fun with BILLY? IKEAFANS.com, IKEA UK and IKEA USA are happy to announce the launch of a contest to celebrate the 30th birthday of the iconic BILLY bookcase. Over 40 million BILLY bookcases are in the wild - is one of them yours? Tell us about it for your chance to win IKEA prizes!